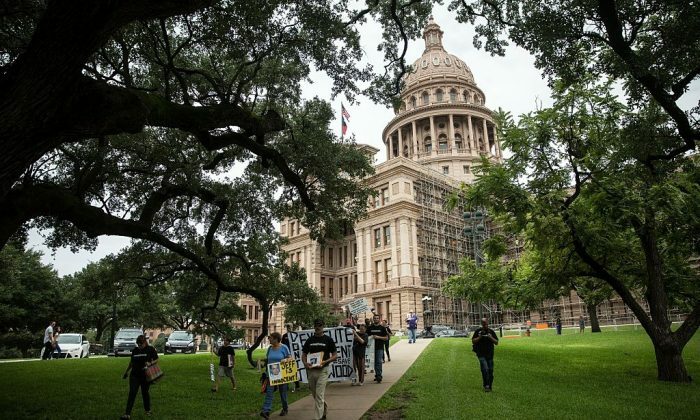 A new report by a Texas government office has recommended city officials consider renaming the city of Austin amid a movement to take down Confederate statues. The report, released by the Austin Equity Office, also suggests renaming a number of streets, markers, and parks that honor the Confederacy. The report lists a number of streets and places to rename, including the Bouldin Creek neighborhood, the Barton Springs pool and bathhouse, and 10 streets named after William Barton, a slave owner who was known as the “Daniel Boone of Texas,” according to the Texas State Historical Association. The Austin City Council already authorized the renaming of two streets, one from Robert E. Lee Road to Azie Morton Road, honoring the first and only African-American to serve as U.S. Treasurer; as well as Jeff Davis Avenue to William Holland Avenue. “[The] Equity Office recommends Council take immediate action to rename streets that were identified in the list for Assets Slated for Initial Review,” the memo reads. Other names of streets and places are designated for secondary review, including the city itself. City spokesman Andy Tate told Austin Business Journal said that the city’s name wasn’t recommended for removal or renaming, but for further review and analysis. Any renamings of roads require public hearings and legislative action from the city council. Though the cost to the public is low, typically primarily for replacing street signs, homeowners and business owners have complained as they have to change their addresses. According to the American-Statesman, a majority opposed the authorized renaming of the two streets. The authors also said that societal values are different today than they were when statues were erected and streets were named. “It is also important to acknowledge that nearly all monuments to the Confederacy and its leaders were erected without a true democratic process. People of color often had no voice and no opportunity to raise concerns about the city’s decision to honor Confederate leaders,” they wrote. The movement has prompted a number of cities to remove statues commemorating Confederate leaders and streets named after Confederates. According to a running list kept by Fox News, more than 30 cities across the United States have removed or relocated Confederate statues and monuments, including Annapolis, MD; New York City; and multiple cities in Florida.